Sword Art Online is probably one of the most talked about anime over the internet in this year. For the most part, I think it's caused by audiences possess different level of background knowledge about SAO series prior to the start of watching the anime series. Sparks fly as people who have seen the story for the first time clash with the light novel loyalists who see this as an adaptation of the original work disagree upon whether certain things in the series have been done well. Since I've never read any of the light novel, my opinion is purely based on the anime itself, not how well the anime adapted the light novel like much of the online discussions are about. On top of that, I've been intentionally avoiding any online discussion related to this topic just so that I won't be tainted by unnecessary information. Overall, Sword Art Online is a very enjoyable experience. Honestly, you can't talk about SAO without thinking about or comparing to the anime started this genre, the .hack//sign. In fact, SAO is a lot more similar in concept to .hack//sign than many others in the same genre since. But the SAO really brought this genre up to a new level. First half of the series, it focuses mainly on the struggle of how people would behave when they found themselves trapped in a virtual world, while the second half introduces a slightly complex picture where family and friends are involved and the virtual reality is no longer life threatening. You can definitely tell SAO's heritage in light novel as you wouldn't exactly call the story smooth flowing. It feels quite...chuncky. Because of that, there's a lack of "epicness" where it usually require a bit more continuous build up to achieve. Also, I think lack of climax of in the final fights attributed to it as well. During the final episode, there's an interesting situation, where I think soon we might have to start to coup with in our own world: when the virtual reality you have experienced is so real, even life and death becomes part of it, how would you be able to hold your emotion within the virtual reality without letting it spill over into the true reality. Recommendation: Purely from the anime itself, I think this is a rather epic and enjoyable. Maybe your opinion would be different if you have read the light novel and you're looking at it as an "adaptation". But as far as I'm concern, this is a good series that is well worth your time. I've come around to the personal opinion that any anime made from light novels is right up my alley, because out of three, all three Animes from Light novels I've watched have been excellently awesome for me. 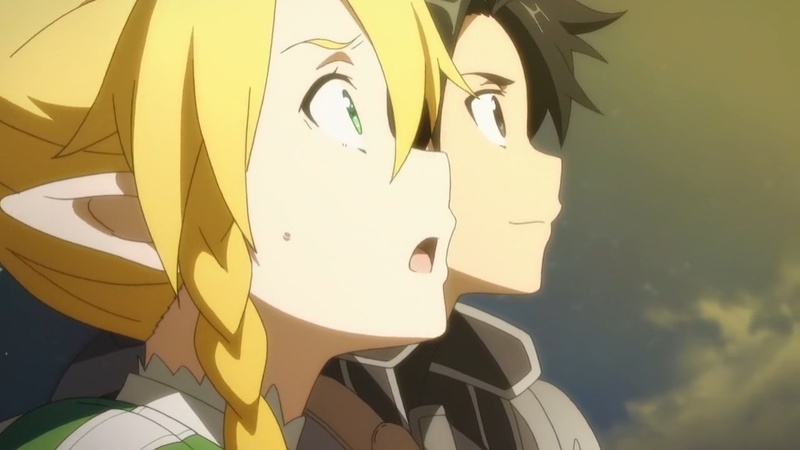 I'm rather lacking in the surprise department that SAO is a Light novel adaptation (there really should be a faster way to say that), somehow I've just got the feel of it now. They always end up being the ones that keep me on the edge of my seat, the few rare animes where I'm actually anxious for the next episode to hurry up and come out. On a separate note, nothing's ever perfect, but I haven't yet had an out-right reason to call foul on changes from light novel to anime, despite being obsessed with Spice and Wolfs world and story. For example, Yes, I do feel that the fabrication of an entire character and subsequent understory, and the entire removal of an arc of story is a touch much (especially since the character was obviously entirely for the purpose of a love triangle, ugh, and the removal was to sidestep having to handle touchy religious opinions), but that's the price of adapting. You can't play a piece of piano music on a violin note for note, they may both use strings, but those strings are producing entirely different sounds even when you're playing the same note. Perhaps I just haven't seen the horrible failures of adaptations out there, but of the three I've seen so far, that all made me get the Light Novel after watching the anime, I'd say there hasn't been anything critical changed by the studio trying to make it fit the Anime slot. The people making the anime aren't going to be 'perfectly appreciative' of a novels unique subtleties, and neither is the novel author of animes finer tunings, that's something gained from professionalism, which takes time, effort, and a love of your hobby to acquire. If they had that, they probably wouldn't be able to forge the adaptation, because they'd either be spread thin between both hobbies, or they'd just be novelists themselves. A big example would be that the Novels obviously continue past where SAO's anime is ending. I'll also make a strong guess that the closer the anime got to the ending, the more changes there were from the novels, to try and lessen the feeling of anticlimax from an ending occurring where an ending wasn't meant to be. In this specific case, perhaps there aren't as many changes, since the anticlimactic feeling is still strong...I mean hell I'd be willing to think they're leaving themselves a door open to do yet another season. I watched both spice and wolf series before I read the light novel. I was a bit puzzled over the second arc during the second season because it didn't make much sense why it's there. After reading the light novel, it all made sense with that additional arc that happened between the 3rd and 4th anime arc. So ever since, every time I come across an adaption work, I always grow a bit wary about how much the adaptation is going to change the original work. In this case however, unlike SaW, which had a fixed 6-episode format, SAO has more of a free flowing format where even if they cut something, it can be smoothed over a bit more easily.